For floor covering or drape in either natural colour or a range of dyed tones. 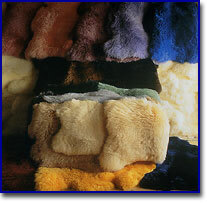 Rugs can be hand tipped with brown or black to give a natural fur effect. The rugs can be supplied as single skins, doubles, trebles or quadruples. Special commissions can be placed for special shaped rugs. For use in wheelchairs, beds and chairs. The dense wool pile cushions the body relieving pressure sores. The perfect product when softness and warmth is required. Ideal natural product for pet comfort. Tanning of skins for the private individual.